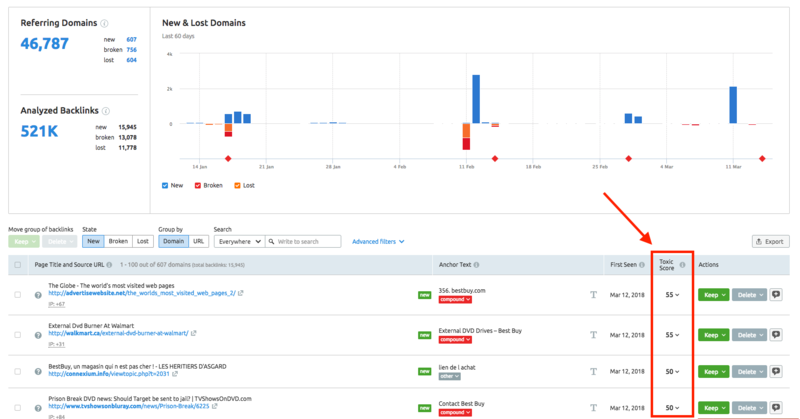 The Backlink Audit Tool Lost and Found report manages all of the domains in your profile that have been newly acquired, lost or broken. Keep in mind that new domains will also appear after integration of Google Search Console, Google Analytics, Majestic or when uploading your own CSV file. You’ll see in the chart below how each category (new, lost, and broken) of domains has performed daily over the last 60 days. Check or uncheck the boxes below the graph that corresponds to that specific category of domains in order to view the domains separately. For example, if you just wish to view the number of new domains, simply uncheck the boxes next to broken and lost to only see those that are new. All of the new domains will be ones that were acquired within the last month and you haven't previously acquired backlinks from them. This is perfect if you are looking to track the link building results of a PR campaign with the hopes of gaining more backlinks. It also gives you the ability to see if any of these newly acquired links are harmful or not because you can check their Toxic Scores in the table below the graph. A domain is determined broken when all of the page with backlinks to the analyzed domain are returned as error codes, which can be caused by a number of reasons. The exact error code will vary from link to link but it is in good practice to contact these website owners to help them fix a possible issue in an attempt get your backlink back. Identifying domains that are now broken gives you the chance to resolve broken link issues as soon as possible. This way, broken backlinks will not build up and cause a larger negative impact on your SEO down the line. Lost domains are domains that you have lost backlinks from within the past 2 months. What this means is Google might still be considering their value when it comes to analyzing your domain’s backlink profile. Since the link was lost relatively recently, you still have a chance to recover that link and maintain your SEO status. You can filter your domains by new, broken or lost by clicking on their respective boxes at the top of your list. This action can also be done when considering links grouped by URL or Domain. When monitoring these domains you can choose to analyze each group individually, or all of them at once. The new domain group will let you monitor your new acquired domains as they come in and evaluate which links are going to bring helpful results and which links you are going to have to take action with right away. If you are working with the broken links group you may want to reach out to these websites and see if you can work with the site owner to fix the error that’s causing the broken link. This can help build a relationship with these domains that could help your site down the road. If you are analyzing domains in your lost tab, these domains are recently lost so you still have the chance to regain them and maintain your backlink profile. To perform any action to a domain you will need to navigate to the far right of the list of backlinks and determine if you are going to want to keep it or delete it. No matter which of these options you choose, you will be able to follow through with it by the URL or domain group. You can also add a comment to the backlink for future reference as to why a certain action was taken.